My wife Sally and I are Spanish language students in Cochabamba, Bolivia, and have been here since the first of July, 2007. I do not pretend great wisdom, or extraordinary insight. On the contrary, I am living the wonderfully relaxed life of a full-time student, soon to be thrust back into the “real world.” Quite a luxury for a fifty-seven-year-old retired teacher. While here, I have learned the power of “slow,” learned to accept the fact that a five-year-old can conjugate correctly while I cannot, and learned that the creative anarchy of the taxi and bus drivers on the streets of Cochabamba will never be understood by an outsider. Probably the greatest lessons learned have been that the people of Bolivia welcome the individuals of the world and are excited to present their country and their cultures with the quiet confidence of an ancient people. As such, I will attempt to present the people of Bolivia through the microcosm of one event, the Festival of the Virgin of Urkupiña. There are many who have written scholarly articles on this fiesta. I will simply present my observations and hopefully illuminate the people. Occurring annually in , a city outside of Cochabamba, during mid-August, the Festival of the Virgin of Urkupiña is an amazing blending of Catholic ritual and local indigenous culture and religion. The Fiesta is a multi-day affair, and we attended two days. The first day is the which is a sixteen hour “parade” with absolutely beautiful costumes and participants. The energy exhibited in this pageant is astonishing and physically challenging for all. They do not march the route, they literally dance the route, and not just a little shuffle; the dances are strenuous, vibrant and testaments of faith and dedication. These young ladies in particular, but all the participants, have dedicated three years of their lives—at least—to the festival, and in return, they make requests of the . It is kind of a quid pro quo prayer: “I promise three years of practice and dancing, and a dedication to the rosary if you, Virgin, will accept my prayer.” The costumes are all handmade; and the riot of colors, the marching bands with their bass drum-driven music, the smells of cooking food, beer and chicha (the local corn-based home brew) and the unique mix of spiritual adoration and physical overindulgence in alcohol and food cannot be adequately captured. We were at the Entrada for five hours. 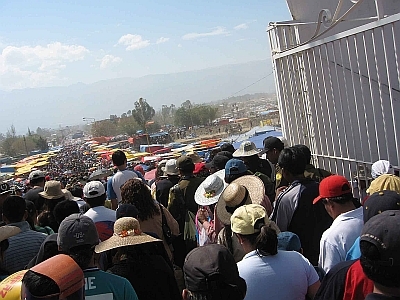 We had great seats and thoroughly enjoyed the experience; however, we were outsiders, as this is a truly local event, though huge here in Cochabamba. Because we were sitting on the route of the Entrada and not doing much walking around, except to get a beer and a snack and find el baño, we did not truly sense the physical vastness of the event. What we did sense was the passions of the people. This is truly theirs. I could witness twenty Entradas and not understand the subtleties. The next day was an equally remarkable, though radically different, day, as it was the . This is a holiday in Cochabamba, so in the morning, Sally and I went back to Quillacollo on a micro (see image above). On the way, our driver thought he knew a shortcut, so we traveled down a railroad bed bumping along the tracks, then through some farms. We were making progress, but we got stuck in a ditch and had to dig our way out. 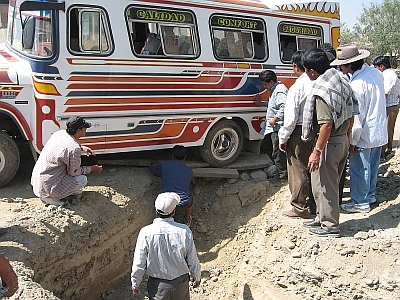 The passengers were unfazed, accepted the delay, and helped direct and dig. They all directed and many dug. Once we re-boarded the micro, we then traveled on the streets and arrived safely, and immediately became enmeshed in the largest crowd of our lives. There were, perhaps, 500,000 to 750,000 people moving very slowly up to the Calvario, then proceeding around the top, stopping to drink, or eat, or watch. All were there to pray for their future or to break rocks as a symbol of their willingness to work for their part of the bargain with the Virgin. 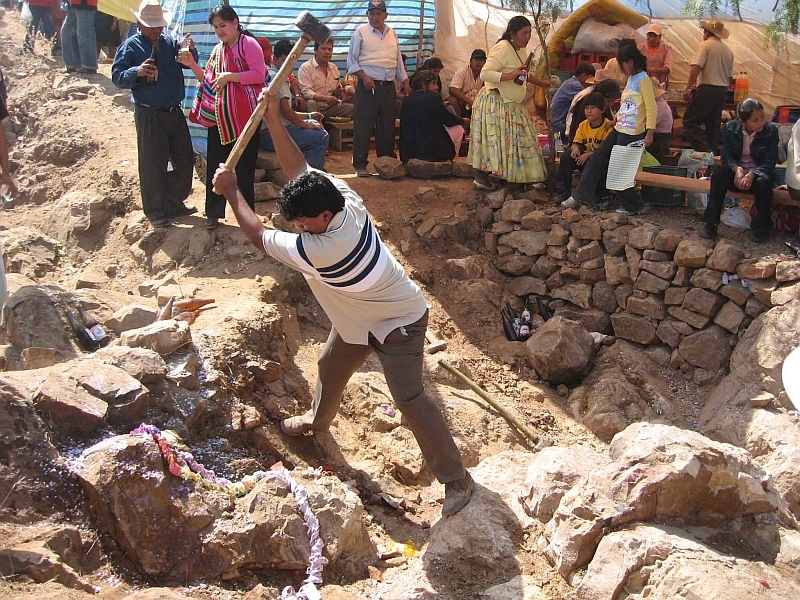 It is not going to happen only by prayer, it takes action and a willingness to work hard—and Bolivians as a culture are incredibly hardworking. They then take the rocks home with them, and the following year, return them to the Calvario as part of the process of promise and action on both parts. The day was a particularly moving day, filled with a kind of quiet, reflective revelry. However, the peace was frequently shattered by brass bands hired by individual families that loudly accompanied the prayers and transformed the requests into celebrations of the future. Strange, but incredibly Bolivian, and incredibly hopeful. This day is really one of hope for the future of the family, for the entire family is involved in the work and the prayers and the celebration. With frequency, they halt the pounding, and pour beer on the ground and sprinkle some coca leaves as an offering and a sharing with Pachamama; and then they drink—or chew—some themselves. The line of people up and down the Calvario was approximately two miles long, and it was solid people, with no pushing and shoving, just a steady shuffling up and down the hill. Our walk was a five-hour prayer surrounded by Bolivians who had come to the Calvario to witness and to participate. Many Bolivians had started their walk in the early morning hours, arriving at the Calvario in time for a 6:00 am mass. Thousands had walked 15–20 kilometers throughout the night, personally asking or thanking the Virgin. We witnessed an incredible event, an incredible fiesta, filled with prayer, anticipation and thanksgiving. 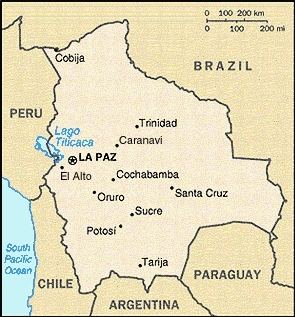 Quillacollo means "mountain of the moon" in Quechua. The Incas considered the moon to be a major female deity, and following the Spanish conquest it was often fused with the Virgin Mary. Spanish for "entrance" or "gateway"
The name Urkupiña is derived from the Quechua word for "on the mountain"—the shepherdess’s cry when she pointed out the Virgin to the villagers. Spanish for "ordeal" or "suffering"
Wow. I arrived in Bolivia September 1—too late, unfortunately, to catch a glimpse of this festival. But thanks to this imagery-rich account, I almost feel as though I were there. I’m convinced that the ladies in the intro image are all sisters. Look at the facial proportions, especially between the center and right-side. Wow Mr. Engelmann, sounds like your having an awesome cultural experience. This article brings back memories. 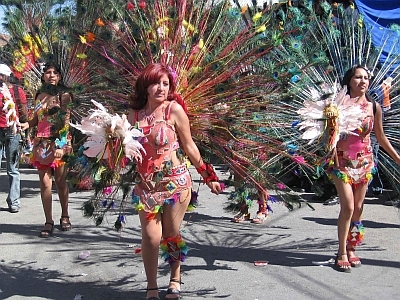 We’ve been to the festival in Quillacollo three times; your description of it is excellent. Now we are participating in the Providence, RI Bolivian community’s version of it (which has been happening for several years at least). I’m working on what might become an article about it and about this very strong immigrant community. It’s my only experience with a culture whose folk traditions are so alive and vital. Thanks for the article Mr. Engelmann!